Sorry I haven’t posted in a while. You know how life is, super busy and mine is also currently filled with Christmas sewing! Anyway, having not successfully taken part in a instagram, Sewing related challenge, I decided to give One Week One Pattern #owop18 a go. 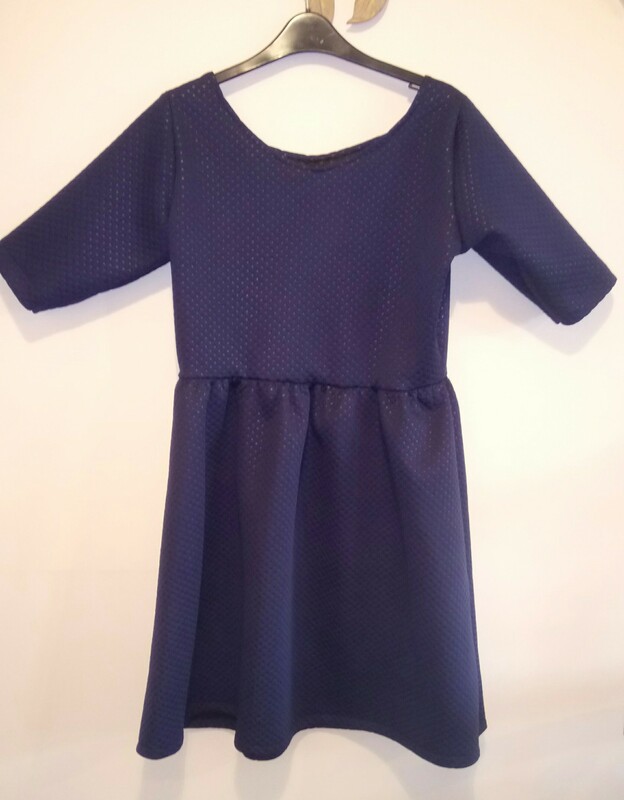 Originally a Tilly and the buttons venture, it has been valiantly ran by the lovely Sheona at Sewisfaction this year. The idea, of course, is that you make the most out of you patterns and wear the same pattern every day for a week. I obviously turned to my trusty Moneta, which I have made several times as many of you will know. It turns out that I don’t actually have 7 though… So this was a perfect reason to sew a couple more! They are so quick. Monday: I’ve used some Black Jersey from Pound Fabrics to whip an easy one up. I lowered the back neckline slightly and extended the sleeve length to full length. I pleated the fabric at once centimetre intervals instead of gathering, using a cheaper fabric as an excuse to experiment and it has worked brilliantly. Every girl needs a comfy black dress. Tuesday: I wore my Paisley Moneta which I wear a lot. Now I’ve been sewing a while, it’s made me realise how long the clothes you make can last. I made this in summer 2017 and it’s still going strong. Wednesday: I made this version last christmas. 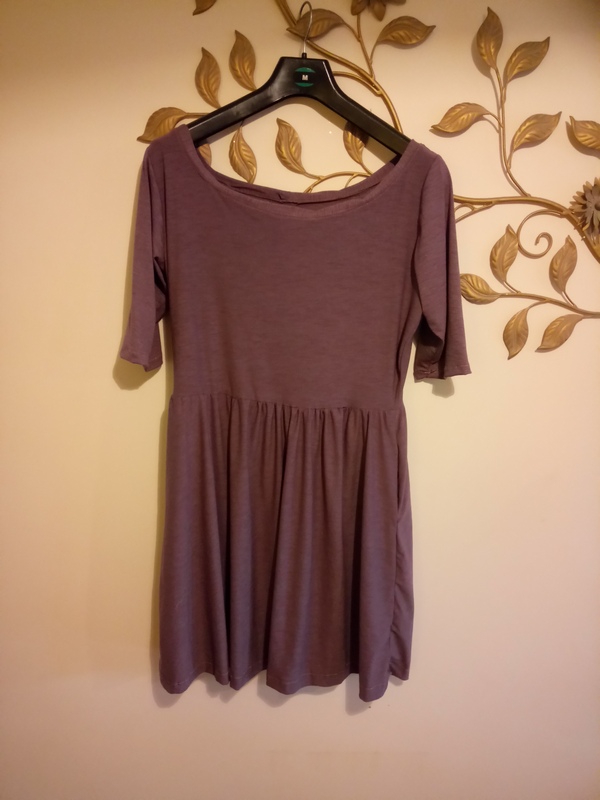 I used a block burgundy colour for the top and a ditzy, black Jersey for the bottom, which gives it a different look again and is a perfect stash buster. Thursday: this was my second weekend owop make. I used another border print jersey from Ebay. I tried to use the border print to my advantage. I made the skirt much longer; it’s midcalf. 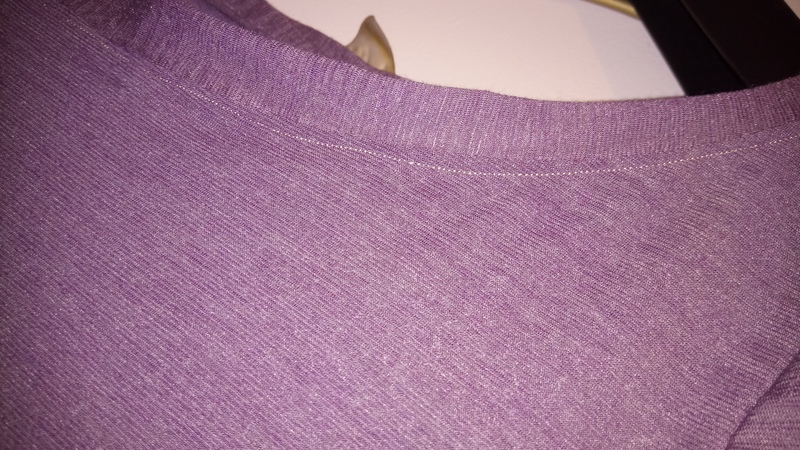 I also extended the sleeve length, an easy but satisfying hack. I also lowered the neckline and used to strips to make a cris cross effect at the back. Friday: This is my version in brushed Jersey, which is beautifully super soft from Sew Me Sunshine. This is the original pattern, with pockets. Please see over on instagram for the daily updates. 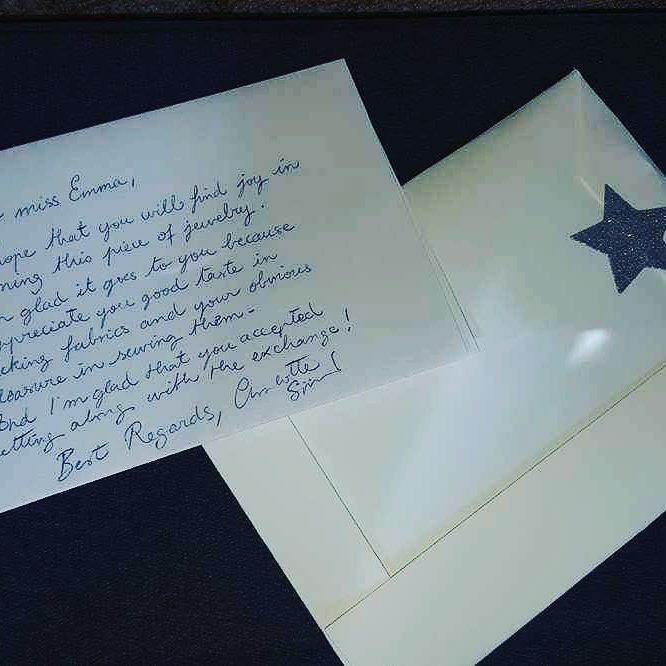 Whilst I’m showing my Monetas, I though I would share a few tips from my experience. I always add an inch to the inside of the neckline because otherwise you end up showing your bra. I personally lengthen the bodice an inch so it doesn’t finish too low under my bust. I always overlock my neckline before I sew so that I can turn it under neatly. I’ve loved watching everyone take part and feel really inspired by the way people have used the patterns they love in different ways. Thanks to Sheona for organising. If you want to see more Monetas, Amy also chose Monetas for their Owop. I know, I know another Moneta but I was in serious need of a pick-me-up! I tried and MASSIVELY failed to sew a Mimi Blouse from Tilly’s Love at First Stitch and it was a nightmare. 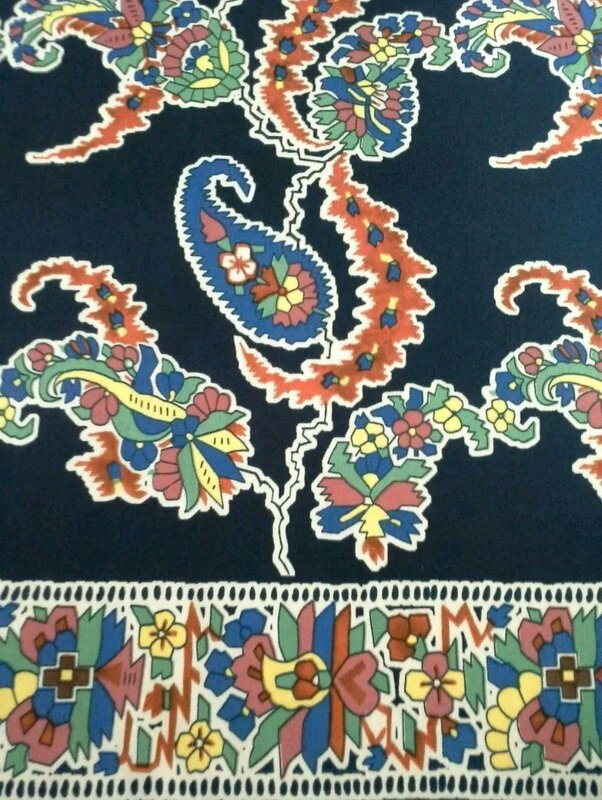 I had this beautiful Spanish looking fabric in orange and pictured a lovely, bright blouse but it wasn’t to be. The yoke is too high up. I added piping as she suggests in the book but it made it stiff and awkward, the sleeves were too small and the top it off, the actual blouse was too, even though lots of people warned it would have a lot of ease. To make matters worse, it was supposed to be my last make before my holidays and 2 weeks away from my machine so I felt really unsatisfied. 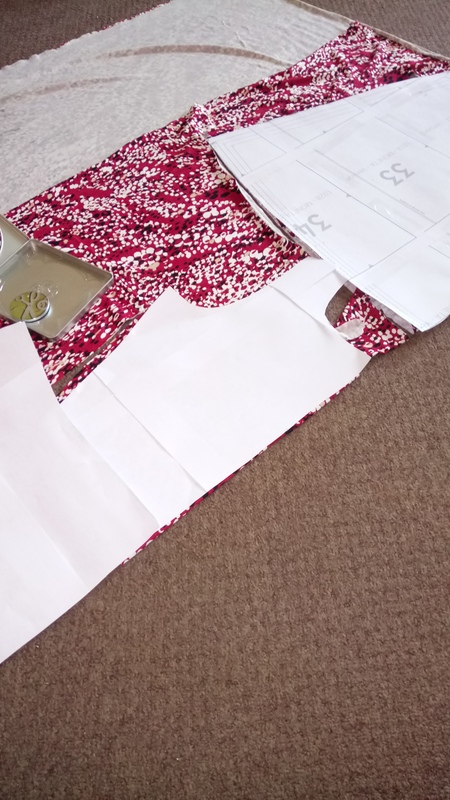 And so my friends, I was consoled… By this amazing fabric and the super quick Moneta. It really was super quick. 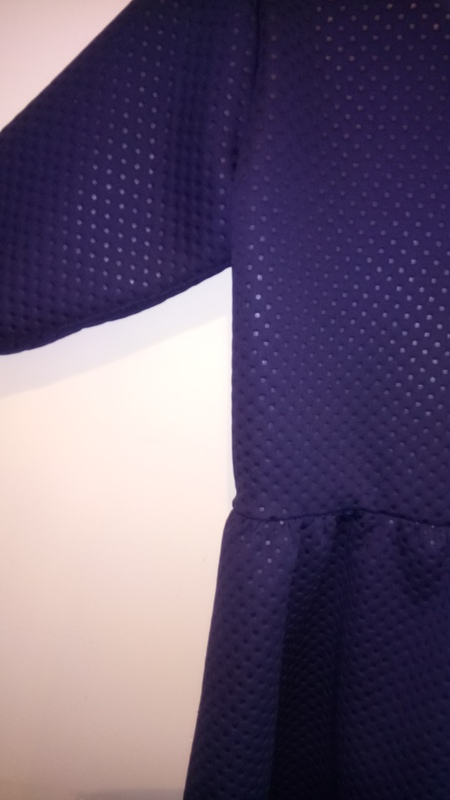 Literally the night before we went on our holidays, knowing I would be without machine and determined to leave on a high, I grabbed this jersey recently added to my stash, the trusty Moneta pattern and cut! 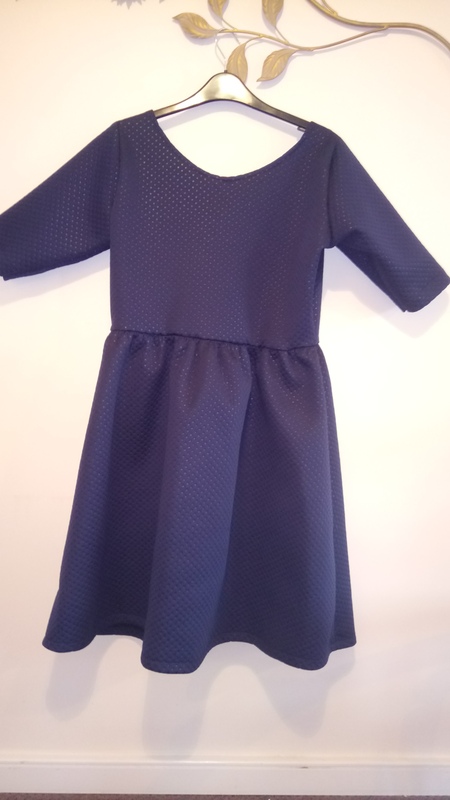 I sewed it together with the speed of a mad woman and had the whole dress complete, including the consideration of the pattern placement, in an hour. I made the following changes; I lengthened the skirt to mid calf, like my Galaxy one. I was hoping for a maxi hack but I didn’t have enough fabric. I wanted to include the amazing colours at the bottom of the fabric in the skirt and I think calf length suits this dress. I lowered the back slightly. I also discounted the pockets (no time for that). That’s it! 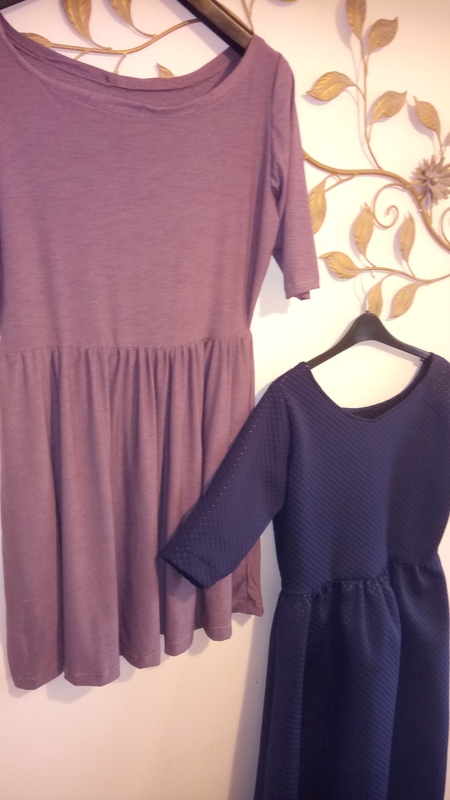 The moneta has been so crucial in getting over my fear of sewing with jersey- I only wish I would now step away from the Moneta and try some new Jersey patterns as was intended for this fabric!!! 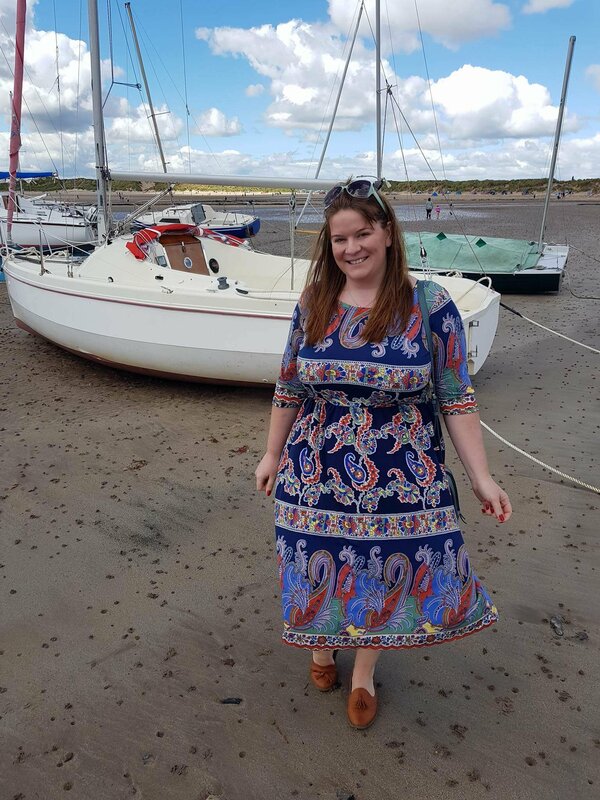 I wore this on my holiday on a trip to Beadnell Bay where we watched the fishing boats come in and took in the views. A perfect dress for that I think! 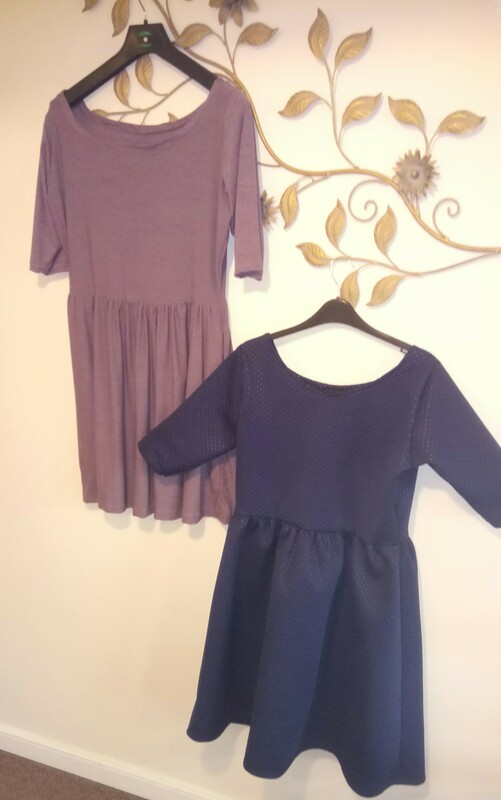 It’s an absolute addiction this Moneta situation and I fear it is getting out of hand. I have abandoned all other patterns and replaced my sewing with Monetas! Why wouldn’t I when they are this cool! I love it so much that I have been making them for other people to share the joy… Not before I’ve rustled another up for myself though! 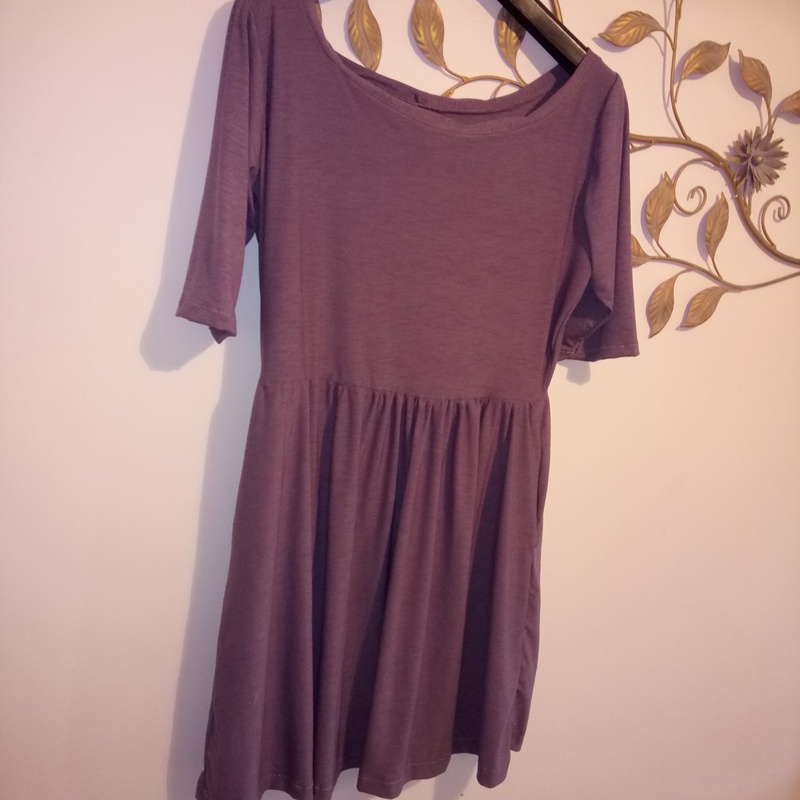 This is mine, in this lovely purple/grey jersey from The Textile Centre. I stuck with version 3; no arms on show here! It whizzes together in no time. Though, it would’ve been even quicker if I didn’t mess the neckline up. It stretched out as I sewed and ended up looking a bit of a mess. 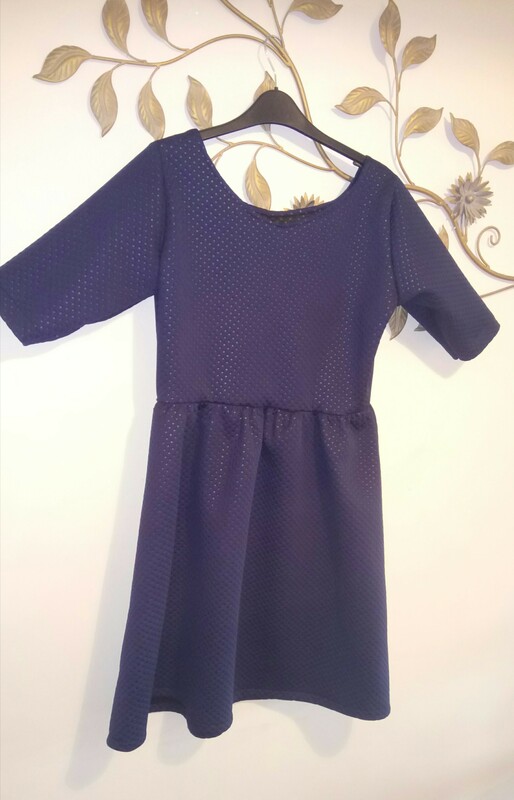 I tried to unpick it but I was making holes, so I cut along the stitch line and added a neckline, which I’m getting quite good at since I did one for this dress. Any tips on not stretching it out though? 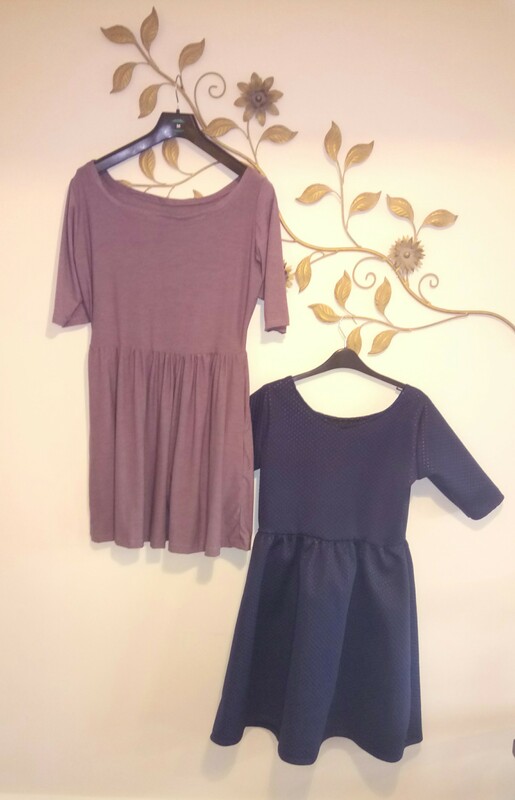 Also, does anyone else find the Moneta neckline can be a little too wide? Not to insult my new fave dress pattern!!. I’m not very good at making garments in just one colour so I’m glad I have. 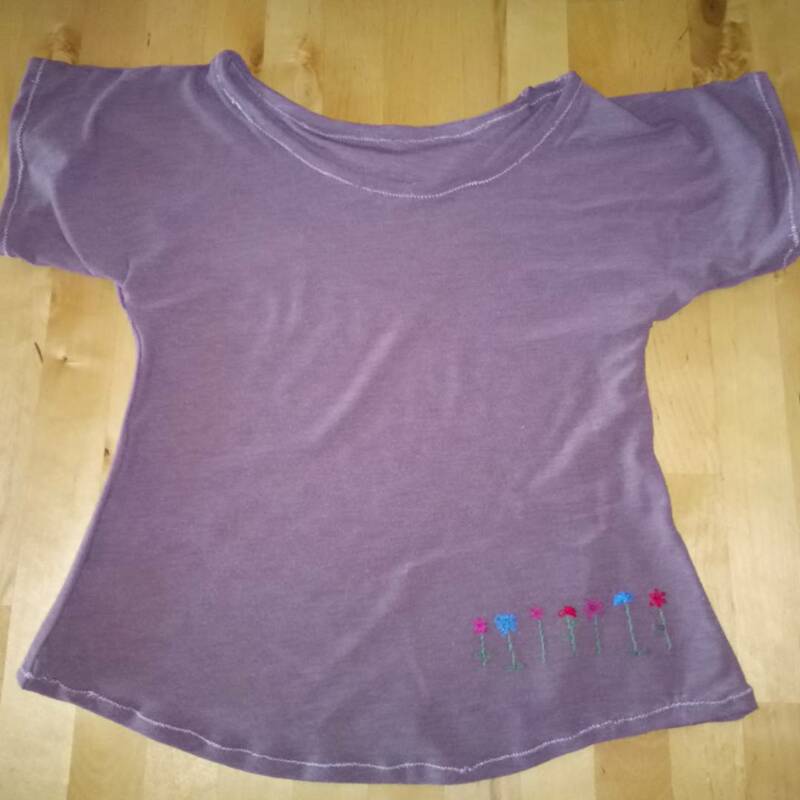 I also used the scraps for this to put together this little t-shirt for my niece, it’s a Jasmine Top, which is a free pattern you can get from Petit Boo on Craftsy. It doesn’t have separate sleeves so it comes together really quickly. Though it’s a bit wonky in places, I’m still get used to jersey and this is super stretchy. I embroidered a row of little flowers too, just to add detail. It’s so cute! Anyway, on to dress two. I promised my friend Sam that I would make her a dress for her 30th birthday. She asked for blue and after seeing my pictures, asked me to lower the neckline. She’s the birthday girl so that’s what I did. It’s made using this really cool jersey scuba (much stretchier than normal scuba) that I also got the The Textile Centre. It has these dimples on it which makes it look a bit different. I think it’s really cool. This one came together really easily as the scuba is so stable and I’m getting to be a bit of a pro at them now! I left the pockets out too as I though it would be too bulky. I decided to use the scraps to make another for me but only had enough to make the top half.. Which I shall save until I have jersey to match it! More on that when I get round to it. 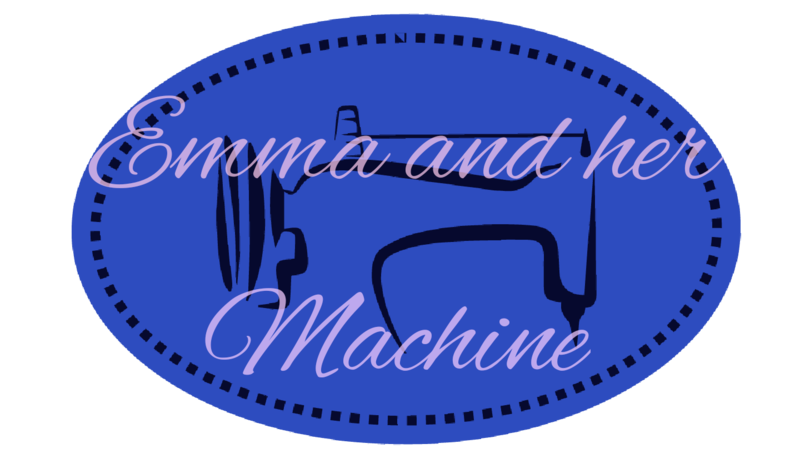 I’m quite excited about this swap so I’ll be creating a special blog post all about it! I’ve had my swap item and it’s amazing so watch out for my blog post next week! I feel this is a much needed step to encourage me to make more practical garments and not those which hang in the wardrobe waiting for wedding invites!! Sign Up Here to make your pledge!